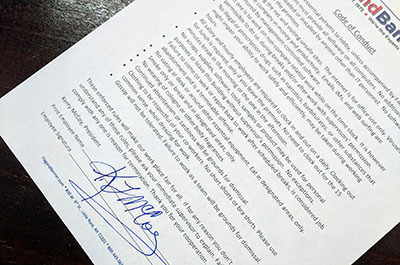 When you first hire on to a company, you receive all these papers to sign and rules to read. If you’re like me, you don’t read them; instead, you throw them in a drawer somewhere. Decades ago, in an exit interview with several good employees, they complained that my management style was too willy-nilly. I did not have clear, defined rules of conduct. This resulted in a haphazard working environment. I listened and I changed. As the boss of FlagandBanner.com, it is my job to have a written list of rules and to keep these rules upfront and enforced. This is a good idea for legal purposes too. In the flag business, the second quarter of the year is the patriotic season, not just for the United States, but for many countries. The reason for all the independence celebrations (i.e. Cinco de Mayo, Bastille Day, and our Independence Day) in the Spring and Summer is because the armed forces of old rarely fought in the winter. It was too cold to move about, so most battles were fought and won in warmer months when the weather broke. Supplies could be brought in and troops could march across the terrain. But I digress! 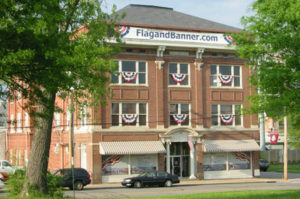 As FlagandBanner.com enters its busy season, my employees’ stress level begins to rise. It is important for me, once again, to resurrect the “rules of conduct” form. This list was compiled from years of employee feedback and is a constant work in progress as society changes. Though tedious and redundant, this act of management is necessary and a good reminder for all of us who work closely together to be considerate. You can never be reminded of a good thing too much. Being an inherent rule-breaker myself has helped me keep the list short. No trivial rules. Some are obvious, “Don’t be late for work” and “Don’t steal,” but there are also some not-so-obvious rules too. 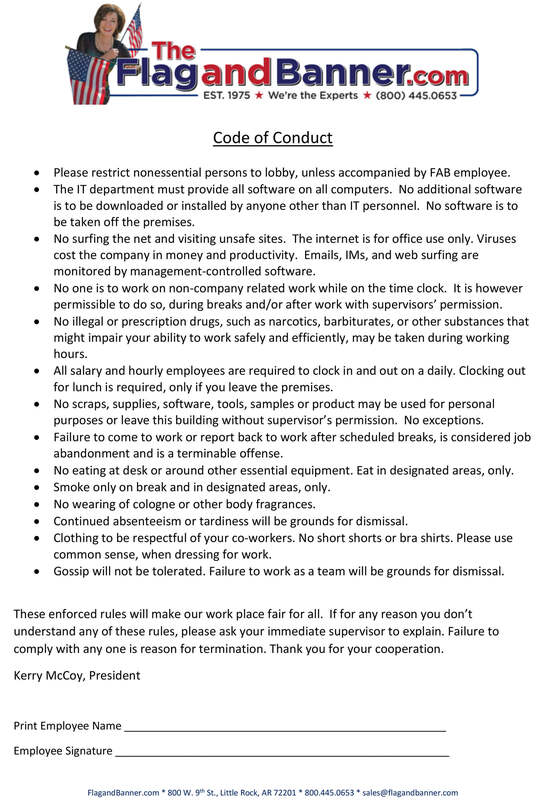 I hope my readers will find our company’s list of rules helpful in either writing their own policies or serve as a gentle reminder on how to be a good co-worker and employee. A harmonious work environment is easier to achieve when everyone is operating under the same standards of conduct.